What is International Forum for Wellbeing In Pregnancy (IFWIP)? This forum aims to achieve this by bringing together everyone from all across the world who has a passion for promoting the health and the wellbeing during pregnancy. This would help in sharing scientific knowledge, expertise, ideas, and resources from everyone who believes in a holistic approach to care during the pregnancy is important to ensure a better outcome, good recovery and a positive experience of pregnancy and parenthood. This initiative is to reach out to every single pregnant mother, partner, and the family to inform them about the importance of mental wellbeing during the pregnancy and beyond. This would encourage them to adopt practices which could help in coping with stress better, reduce the incidence of severe mental health illnesses and ensure early recovery. This would also provide resources for more information and support. 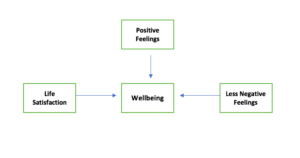 This is also known as ‘Subjective Wellbeing’ as described by Diener (1984). This usually indicates happiness in life and a positive and holistic outlook towards health. How IFWIP aims to address wellbeing during pregnancy (and beyond)? Pregnancy wellbeing ensures a strong and positive beginning of life. This builds a strong foundation of vitality, positive health and prevention of illness in the life after the birth. This is essential for the happiness, peace, prosperity and the progress of the entire human society. We strongly feel that wellbeing (before, during and after the pregnancy) can be achieved with the participation of everyone in the society. This cannot be attained through the efforts of an individual pregnant woman and her family. We feel that ensuring a positive brain health is fundamental to positive feelings of life. We believe that this could be achieved through health and lifestyle (such as healthy diet, exercise, rest and relaxation) and social activities at the individual level. Measures to obtain a good brain health ideally should start as soon as possible in life. This is particularly helpful in pre-conception stage (i.e., when someone is considering a pregnancy). However, it is never too late to make a better start in life. Good brain health also helps pregnant women (and her partner) to face challenges (due to the bodily changes), combat stress and reduce the risk of developing mental health disorders (both during the pregnancy and beyond). 10)Transition to parenthood and challenges of parenting. 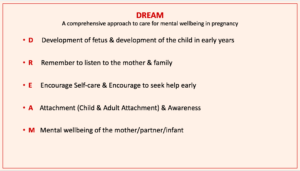 Mental health and wellbeing should constitute an essential component of the care of the mother during every pregnancy. This is regardless of whether she had experienced any mental health illness before pregnancy or in any previous pregnancy. The World Health Organization (WHO) defined health in its 1948 constitution as “a state of complete physical, mental, and social well-being and not merely the absence of disease or infirmity.” Therefore this should also apply to the provision of comprehensive pregnancy care during every pregnancy for the optimum outcome for the mother and the child. This could be essential to establish a strong foundation for happy and fulfilling life. But sadly addressing the mental health has remained neglected in many pregnancy care pathway all around the world. Suicide as a result of serious mental health illnesses is still one of the biggest killers of new mothers all over the world. According to the WHO, for every death of the mother, there are 150 ‘near misses’, therefore the death statistics are just ‘the tip of the iceberg’. Optimum information and interventions could certainly prevent the loss of many valuable lives. It is estimated that 10-15% mothers suffer from Perinatal Mental Health (PMH) conditions. It is now considered that depression and anxiety are equally prevalent during pregnancy period as of post-childbirth time. Therefore this is one of the most common health conditions during pregnancy. – growth restriction of the developing fetus in the mother’s womb. Therefore achieving the optimum mental wellbeing could potentially reduce such untoward complications. Ensuring mental wellbeing of the pregnant mothers could ensure good physical and mental health of the future generations to come. Stress/ mental illnesses can lead to many physical, neurodevelopmental and cognitive problems through its effect on fetal programming. Therefore it is important for the health and well-being of the future generation of the human society. Untreated mental health problems during pregnancy could lead to an increased chance of postnatal mental health conditions such as Postnatal depression and Postpartum Psychosis. For example, one-third cases of Postnatal Depression (PND), it is the continuation of depression during pregnancy. The cost of untreated Perinatal Mental health illnesses could be huge. For example, a report published by London School of Economics (LSE) showed that UK National Health Service (NHS) spent £8.1 billion every year to deal with the consequences of Perinatal Mental Health (PNH) illnesses. Almost three-quarters of this are, in fact, spent for the care and treatment of the consequences of the maternal mental health conditions to the children. Whereas, only £375 million per year is needed to be invested to provide care for PMH conditions according to the national standard. This saving could be invested somewhere else for the betterment of the society. This is a statistics from the UK and could reflect the gravity of the cost in many other countries of the world. As the stress and mental health conditions during pregnancy could have an adverse impact on so many factors, it is important that we take a comprehensive approach to focus on every single aspect during the care of the mother during pregnancy. This is just for convenience purpose and every health professional caring for pregnant mothers should have their own. But most importantly, we must have a comprehensive and multidisciplinary strategy to consider all possible adverse consequences of stress and mental illnesses during pregnancy.